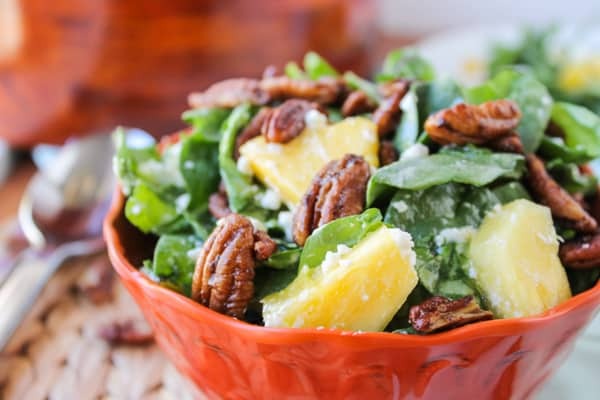 Pineapple spinach salad is a fun twist on the traditional strawberry spinach salad. There’s pineapple in every bite…because who really wants to eat spinach? It was in that same moment that I noticed not one, but two pimples on her face. Like the 13-year-old kind. Chicken or the egg, my friends? Is her attitude making her pre-pubescent or the other way around? And where is my toddler?? This salad was born in the produce section. I mean, obviously, but I just mean that I was literally in the produce section at Safeway, staring at the 7-dollar boxes of strawberries and craving a strawberry spinach salad like nobody’s business. I couldn’t justify it, not in any part of my penny pinching brain. But then my eyes fell on a $2.99 pineapple and I thought, well, why not? I really like how tangy this salad is. The pineapple, the feta, even the dressing. If it sounds like too much to you, omit the mustard from the dressing, or up the sugar. It’s such a simple dressing; you could put lots of different spins on it. Let me know if you try this out! P.S. I’m doing a guest post for a friend this Friday! It involves steak. And goat cheese. You know you want in. Stay tuned! 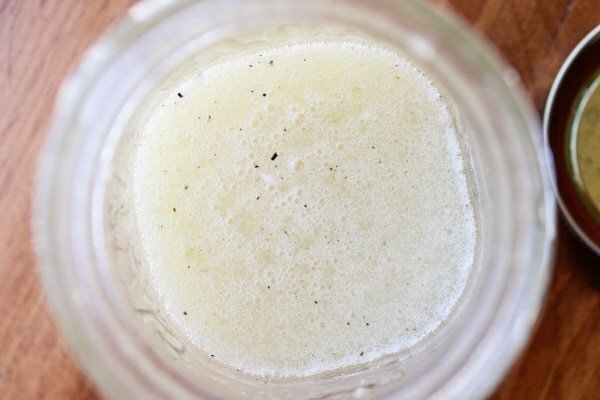 Combine all the dressing ingredients in a mason jar or tupperware. Shake vigorously and set aside. In a small pan, heat the butter over medium-high heat. When hot, add the pecans and stir to coat. Add the brown sugar and stir again. Stir occasionally until the sugar starts to caramelize, about 2-5 minutes. Remove to a wax paper lined cookie sheet and let cool. In a large bowl add the spinach, pineapple, and feta. Toss to combine. Sprinkle the top with pecans and serve with the salad dressing (you might not use all of it). This salad is heavy on the pineapple. 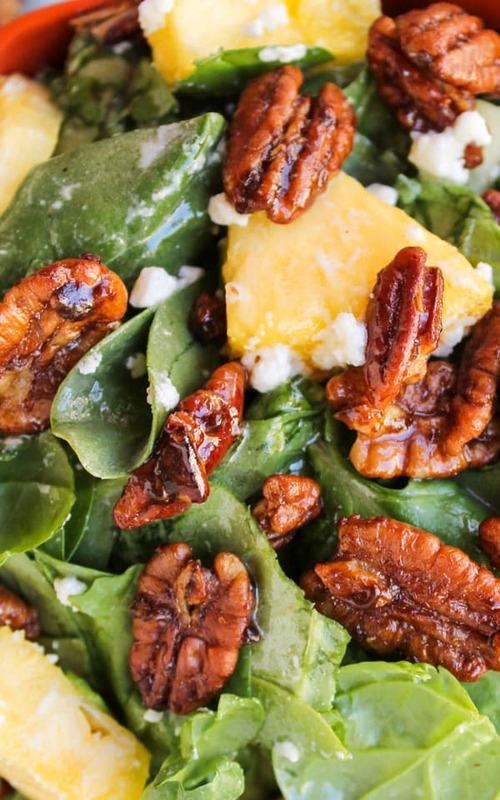 If you want it more salad-y, add more spinach. Also, feel free to buy pre-candied pecans. This dressing goes great on pretty much everything. I had never made a spinach pineapple salad before and the first will certainly not be the last. We almost always have fresh pineapple in the fridge and fresh spinach as well. This was not only super delicious but a life saver for me as well. What? No salad makings for dinner? Just a patient container with the spinach. The only change I had to make was using goat cheese instead of feta. Thank you so much for this recipe! Ooh this would be delicious with goat cheese! Great idea Laura! Man I wish I always had fresh pineapple in the fridge. :) Glad you liked it. Great idea taking this to a Hawaiian party! It’s perfect for that. Thanks for the idea Jane! I’m so glad you liked it. This is the best salad ever!! I make it often it is so easy! If you haven’t made it be sure and try it you will love it. 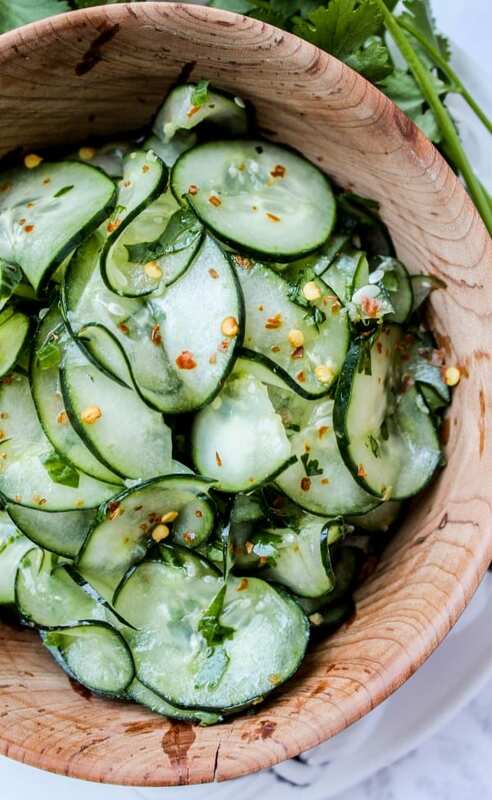 Delicious salad! I broiled my pineapple to bring out the sweet. I think next time I’ll just toast the pecans, although the sugared pecans were delish. Maybe some toasted pine nuts instead. Great salad–thank you for posting. It’s cold and dreary here and this salad was sunny and delicious! Ooh! Love that broiled pineapple idea! I’ll have to try it with pinenuts sometime too. Yum. Glad you enjoyed it Glenda, thanks for commenting! I made it last night for our Christmas dinner. It was so good !! Everybody wanted the recipe ! Thanks !! Hooray! I’m glad it was a success Julie! Happy holidays! My brown sugar did not melt. Stayed crystallized…what did I do wrong? I’m not sure what happened Beverly! The sugar is supposed to crystalize a little bit and stick to the pecans. Sorry I can’t be more helpful! Beverly try melting the butter a little on low heat then adding the brown sugar and stir until all is melted. After the butter ,brown sugar mixture is melted add your pecans stir to coat and put in a 350 oven for about 8-10 minutes. Cool on some wax paper until they are set then break up to put on your salad or ice cream for that matter. I hope this helps. Made this salad tonight it was amazing! Even my husband loved it and he is not a fan of pineapple! Well done! Awesome Shannon! I’m so glad you loved it, and that you could convert your husband. Pineapple is definitely worth converting for :) Thanks for the review! Love it! You always seem to know what I’m craving — it’s been pineapple all week! This is just how I like my spinach salad – heavy on the toppings! I love pineapple, and those pecans are calling my name. What a great salad! I’m completely convinced that toddler girls are pint sized teenagers. It’s like God is giving us advanced preparation for the actual teenage years, because He loves us and doesn’t want us to go into complete shock. When Trinity was little she shouted loudly in the preschool parking lot for all to hear that I was “practically ruining” her life. So. Much. Fun. Love the switch-up of pineapple for strawberries! 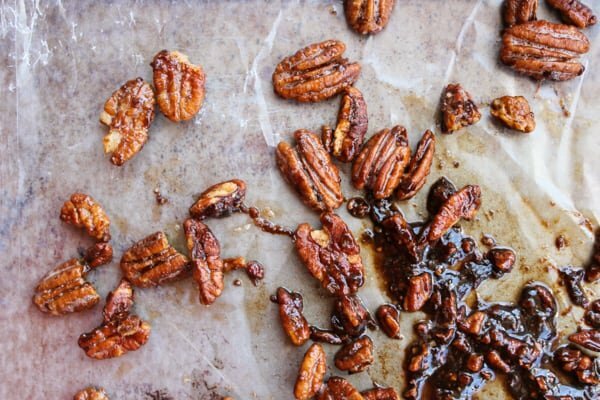 And those pecans look to die for! Also, just watched the JLaw video. She wins. 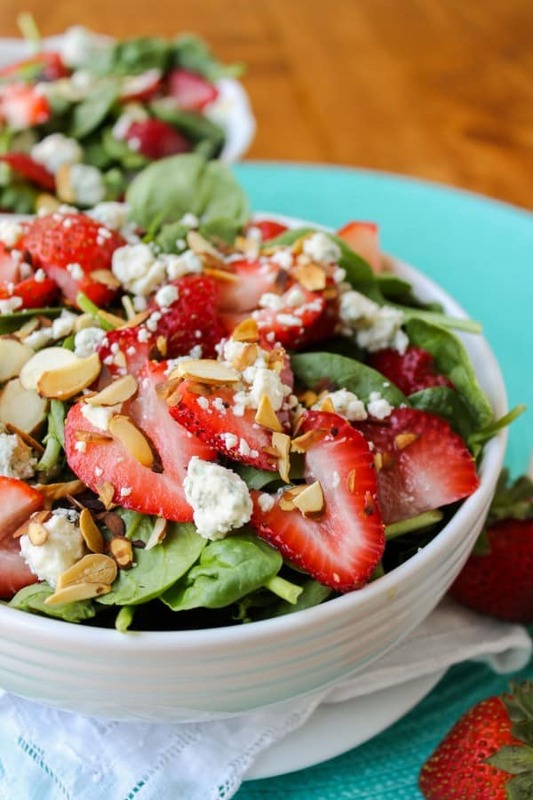 Strawberry Spinach Salad (or Triple S as I like to call it) is my jam, but this may give it a run for its money. Your pictures are divine as always. Thanks for including my Maple Salad! Exactly – why the heck not?! 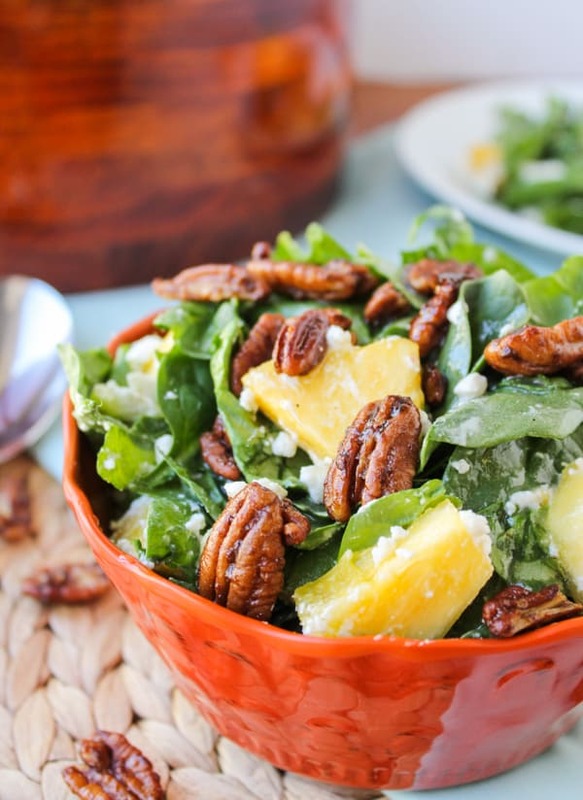 Pineapple is the new strawberry and this salad looks delish! I’m all about that tang, and feta! Loving all the fresh flavours and vibrant colours of the produce in this salad. Great recipe and one that I must try! Karen, pineapple on a salad looks so good… my love handles will thank you as well! Wondering how so many food bloggers are so tiny!?! I love spinach salads! Well, when they have lots of fruit, toasted nuts, and a sweet dressing. I never thought to put pineapple in but it sounds/looks fantastic!